Love 'em or hate 'em (but if you're reading this, you probably fall into the former category), skinny jeans are here to stay. But that doesn't mean that your favorite pair from five years ago needs to. Fashion girls are always on the hunt for the latest denim styles, and brands are providing more updated skinny jeans options than ever. Gone are the days when if you wanted a new pair of jeans, you were forced to resort to the same stretchy, low-rise, plain skinny jean styles that everyone else was wearing. For 2017, there are new brands to try, and veteran brands are thinking outside the box with brilliant results. To help you with your search for a fresh new pair of skinny jeans, we sourced some of the best skinny jeans on the market and called out why we think they're so special. From the pair all the bloggers are wearing to the under-$100 Levi's style that's selling out, shop our skinny jean picks to usher in 2017 below! We're loving this exposed button-fly detail. Bloggers are already obsessed with this 100% cotton style (and it's selling out fast). This editor can attest to the fact that this Levi's new release is well worth the money. Re/Done's new line of non-vintage denim features this perfectly cropped pair that all the cool girls are wearing (just take a look at its Instagram for proof). Tired of denim? Meet leatherette. According to the item description, these feature "an extra panel of fabric along the inside of the leg that creates the illusion of a slimmer, longer leg." This well-priced brand's jeans are ultra-slimming (trust us). This new brand is available in sizes 0 to 24, and its jeans come in a wide range of washes. While frayed hems aren't exactly new, we're seeing an abundance of jagged, exaggerated frays, which feel fresh. Vintage-inspired hardware makes these feel so special. 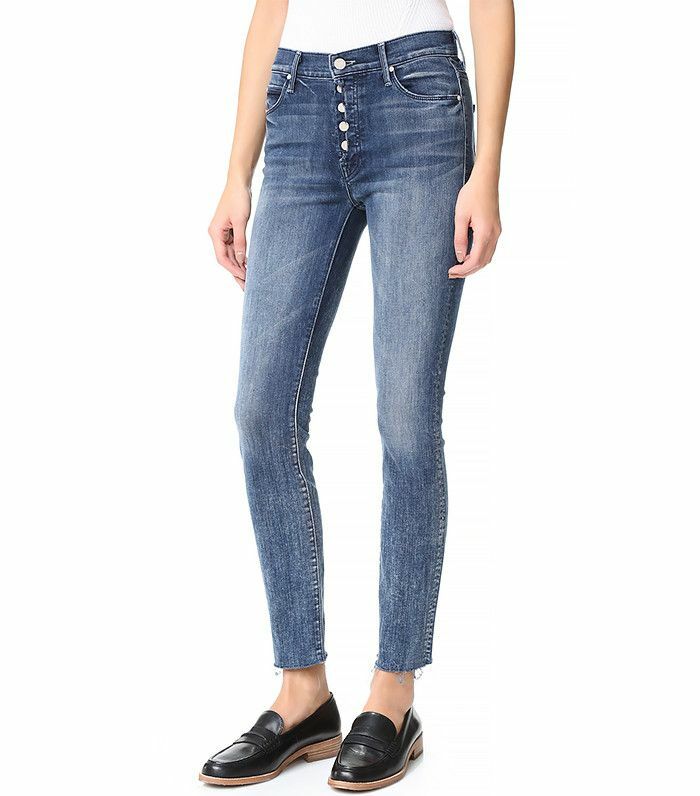 Topshop updated its high-rise skinny jean style with rigid denim, and they look so expensive. Bella and Gigi Hadid would approve of this lace-up design. Behold: Ripped and patched jeans that actually look sleek. Like it or not, low-rise jeans are coming back. Embroidery is still trending in the denim department. Everything this Swedish brand touches turns to gold, including denim. Now that you've chosen your new skinny jeans, check out the 2017 way to wear them.